Avoid the crowds by pre-booking your entrance ticket to Ljubljana Castle. Ride the funicular to the top of Castle Hill, then explore the medieval fortress at your own pace, visiting the Pentagonal Tower, Castle Chapel of St George, Penitentiary, and Rustika gallery, then enjoying spectacular views from the Watchtower. 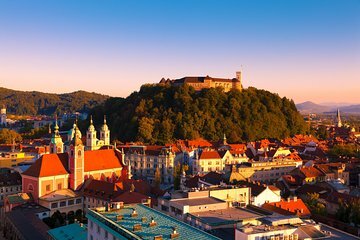 Make your own way to the Ljubljana Castle ticket office at a time of your choosing and hop on the funicular (if option selected) for a scenic ride to the top of Castle Hill. On arrival, set out on a self-guided tour of the castle, starting by browsing the exhibitions and learning more about Slovenian history. Visit the Penitentiary, the Castle Chapel of St George, and the Pentagonal Tower, then stop by the Mini Theatre to watch a puppet show or browse the Rustika gallery of arts and crafts. Be sure to take in the views from the Watchtower and stop for a coffee at the Castle Coffee House (own expense), before heading back down on the funicular.